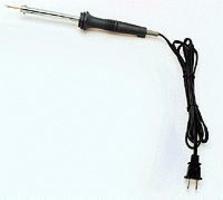 Shop online for 29 soldering irons and accessories at discounts up to 31%. Allied Manufacturing (TIX) is ranked #1 out of 7 soldering irons and accessories manufacturers, followed by Walnut Hollow, and Du-bro. 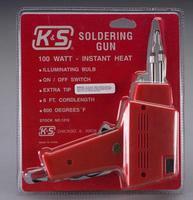 This is a 30 Watt Soldering Iron from K & S Engineering. This is a set of 1/8" diameter Heat Shrink Tubing from Dubro. This is a set of 3/16" Diameter Heat Shrink Tubing from Dubro. This is heat shrink tubing that has been designed to shrink up to 1/2 of its original size with the use of a heat gun, lighter, soldering iron, etc. It's ideal for insulating electrical splices, and covering electrical plugs and connectors, plus it has many other uses. They come packaged in 3" lengths. This assortment has 2 each of 1/16", 3/32", 1/8", 3/16", 1/4", and 3/8". This is heat shrink tubing that has been designed to shrink up to 1/2 of its original size with the use of a heat gun, lighter, soldering iron, etc. It's ideal for insulating electrical splices, and covering electrical plugs and connectors, plus it has many other uses. They come packaged in 3" lengths. They have a 1/16" diameter, is blue in color, and come 4/pkg. This is a set of 3x3/32" Heat Shrink Tubing from Dubro. This is heat shrink tubing that has been designed to shrink up to 1/2 of its original size with the use of a heat gun, lighter, soldering iron, etc. It's ideal for insulating electrical splices, and covering electrical plugs and connectors, plus it has many other uses. They come packaged in 3" lengths. They have a 1/8" diameter, is red in color, and come 4/pkg. This is the Reedy 15 Piece set of 4.5mm Shrink Tubing. This is a set of 3x1/32" Heat Shrink Tubing from Dubro. This is a Set of Replacement Tips for K+S Engineering's 60 Watt Soldering Iron. This is a set of 3x1/16" White Heat Shrink Tubing from Dubro. This is a Set of Replacement Tips for K+S Engineering's 30 Watt Soldering Iron. Heat Shrink Tubing by Du-Bro.